When artists create paintings their focus is typically on issues of aesthetics. Concerns over the substrate, ground, painting materials and the overall durability or integrity of the work are typically either built into the working style, or not. Usually, last among the concerns for the work is its stability in regards to its storage and/or shipping. An artist may have looked at any given painting hundreds of times to assure it meets certain criteria of the show, event, or new owner; but, in order for the work to survive, it is critical to look at the work from the unusual perspective of the mover. How fragile is this work? How heavy is it? What are the dimensions? Are there any special concerns for this object that need to be considered? Successfully transporting artwork hinges on several key factors. Understanding what sort of things can go wrong and what precautionary measures must be taken, will greatly reduce potential problems. Paintings constructed with acrylic artist paints seem indestructible compared to many more delicate painting mediums such as gouache, watercolor, encaustics and tempera, or drawing mediums such as pastels or charcoal. The common understanding of the advantage of acrylic paints over oil is that they will not suffer the problems caused by oil paints’ embrittlement over time. Under most conditions, acrylic paintings remain flexible and are able to withstand considerable abuse. It is just this sense of ease of care that artists have presumed, which has led to carelessness and caused significant problems when transporting or moving acrylic paintings.There are many helpful resources for artists to consult before packaging and transporting works. This issue of Just Paint offers some excerpts from these resources. The purpose of this article is not to recreate those resources, which are rich with examples and suggestions, but to examine some of the significant issues with works completed in acrylic that may not specifically be covered in this compilation of literature. A resource list is included at the end of this article for invaluable references regarding appropriate care when moving and storing acrylic paintings. This article is organized starting with the most protective of all the packaging techniques, crating. This is done to call specific attention to best practices; realizing that artists more often than not find other creative ways to transport work. Best practices are provided for these other methods as well, with the important caveat that none of these methods is without risk. As one moves down the ladder of best practices, the risk significantly increases that something untoward may happen to the work. Acrylic paintings have several unique attributes that create value as a fine artists’ medium, but these attributes can also be significantfactors for concern in addressing the packaging and moving of the paintings. Under most environmental conditions, acrylic paintings are very flexible, which dramatically reduces the potential for cracking in most situations, yet the price paid for this flexibility is a softer film; one that can be scratched, scuffed and marred easily. This is even more of a challenge when working with very matte or underbound acrylic paintings (meaning overloaded with pigment or other solids, exceeding the critical ratios of pigment to binder). Another property of this flexible paint surface is the relative permeable nature of the waterborne acrylic. This property allows for dirt or pollutants to become embedded (especially in a fresher film). Finally, the most significant property of the acrylic film (again especially representative of fresh films) is the potential tackiness of the surface. transit. The obvious way to prevent this problem is to ship in a temperature controlled truck. In the case of shipment by air, steps must be taken to assure that the paint layer does not vibrate during transit. The use of a rigid backing board will sufficiently dampen transit vibrations. How a painting is constructed is crucial in determining the potential methods of transportation. A canvas can be transported either stretched or unstretched and therefore, it’s important to consider the consequences of both. A rolled canvas may ship more easily and cost efficiently, but when it arrives it will have to be unrolled and re-stretched – both actions may damage the artwork. Rolled, the surface is seemingly protected, yet in this condition, care must be taken to avoid the potential of the painting surface picking up fibers in the overlying canvas. If the stretched canvas is to be moved, the surface and back must be protected and the corners must be able to sustain an impact from handling. Additionally, if the work is transported in cold weather, provisions must be made for reducing shock to the painting surface. These issues will be addressed later in the article. A panel painting or works attached to rigid board will also need the surface and corners protected and although it is significantly protected from vibration, it will have to potentially withstand other objects being stacked on top of it. The age of artwork is also of importance during moving. While acrylics dry very quickly, they can take much longer to fully cure. Film thickness, materials used and environmental factors determine the time required for paint films to cure. An uncured acrylic film will be softer and more prone to blocking and ferrotyping, while an older, more fully cured piece will be less prone to damage. There are four stages involved in the drying of acrylic paint films (See Figure 1). The first stage is a paint film retains its shape as it cures. If a partially cured painting is rolled up for shipping and stays rolled while the film cures, it will be very difficult to level out the canvas when unrolled. This rolled film will be more likely to crack as it’s unrolled, especially under lower temperatures. Folded paintings would suffer even more so.the initial evaporation of water occurring at a linear rate, throughout which the paint remains wet and workable. The second stage begins as the acrylic solids in the film become more compacted. In the third stage of drying, the acrylic polymer solids – more or less spherical in shape – begin deforming as a result of capillary action caused by the flow of water to the surface, thus eliminating interstitial area and forming a continuous, honey-comb like structure. At this point, the paint film feels dry to the touch. The last stage of drying involves the final evaporation of water and coalescing solvent, particle compaction, along with chain entanglement of the polymer solids, forming a continuous film. Critical properties such as adhesion, hardness and clarity are not completed until the film is fully cured. (For more information about acrylic film formation, refer to the GOLDEN “Technical Notes on Drying” Information Sheet). An acrylic film is at its greatest risk during this curing process.If the artwork is shipped before the paint has been allowed to fully cure, several negative situations can occur. Since the paint film is still developing, it has the greatest chance of adhering to anything and everything with which it comes in contact. Packing materials such as glassine and cardboard can become permanently bonded to the paint surface. Two paintings facing and in contact with each other can easily become bonded together, most likely resulting in the damage of both surfaces. Additionally, a fresh paint film is more likely to attract dirt and dust particles that will potentially become permanently embedded in the paint film. Thick paint films can develop cracks and crazes during excessive movement while curing. Cold temperatures can harm the film formation process and may even result in early delamination. Temperatures below 49° F do not allow for the proper alignment and deformation of the polymers. The transfer of texture from the packing materials to the surface of the painting. Sheen alteration in high spots. Unwanted texture created on smooth surfaces, or the reverse. Paper, plastic and other packing items physically attaching to the painting surface. Attempting removal may pull up paint or harm substrates. This generally requires sharp impact to substrate or surface at temperatures below 45° F.
This can also occur when a painting, still drying, receives a gentle impact. If you want your paintings to have the best chance for longevity, put each painting into its own packing container. This eliminates the opportunity for surface contact, assuring a greater chance that the artwork will arrive without impairment. Careful planning and packing will increase the likelihood that the support will also remain undamaged. Of course, this is also the most expensive means of packing and transport, and admittedly, artists are forced to make significant compromises in shipping. Yet it must at least be an important consideration before going to lesser protective methods. The volume of the case depends on the size and number of paintings to be packed, thickness of thermal insulation and thickness of cushioning materials used. The type and amount of foam materials to be used in the packing case must be determined prior to case construction. There are limitations to the size case that can be accommodated by transport vehicles. For dimension and weight requirements contact your local transportation service. aluminum and fiberglass. Plywood has a high strength-to-weight ratio, provides some insulation, some relative humidity buffering, and is relatively inexpensive. If plywood is used as a construction material, the thickness of the plywood has a considerable effect on the puncture resistance of the sides of the case. Plywood thicknesses between 3/8 inch and 1/2 inch are typically found on small-to-medium sized cases, up to 72 inches long. Plywood thicknesses up to 3/4 inches are found in the larger cases. The construction methods of the case, particularly where materials are joined, have a significant effect on the strength as well as the rigidity of the case. A case having edges and corners that are well joined can have over ten times the strength and one-hundred times the rigidity of a case that has corners and edges that are poorly joined. It is recommended that the edges and corners be both screwed and glued together. For cases light enough to be lifted by one or two people, handholds should be provided on the case. For cases requiring mechanical means for lifting, such as forklifts, blocks (skids) should be provided that allow the forklift tines to slide under the case. Large packing cases containing a single painting can be high and narrow. This can make them unstable and prone to topple even if slightly jarred. Provisions should be made to prevent such accidents. It is advisable to attach backboards to the reverse of all paintings to reduce the potential of damage caused by puncture, vibration and shock.l A stiff backing board will enclose an air cavity behind the painting. As a consequence, the painting’s tendency to vibrate is reduced due to the stiffening effect of air trapped between the backboard and the reverse of the painting canvas. A flexible backboard may have limited effectiveness. Relatively stiff materials are best for backboards, or securing the center of a flexible backboard to the cross braces on larger works. Large stretchers usually have crossbars. 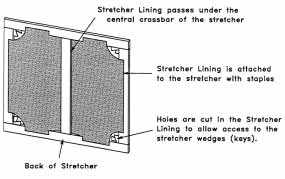 Several small pieces of the backboard material should be cut and attached to each open rectangle bordered by crossbars and outer stretcher members, if possible. The foam should be very close to the back of the canvas without actually touching it. A low-density polyester urethane foam works well because it is soft and relatively lightweight. Polyester urethane foams are not chemically stable and should not be left behind the painting for extended periods. Many factors affect the rate of the foam’s deterioration, making it impossible to estimate how long the foam can stay behind the painting. The foam can be attached to the backboard with double-stick tape or hot glue. The foam must be securely attached to ensure that there is no risk of it pulling away from the backboard and coming in direct contact with the canvas. 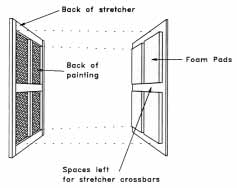 Stretcher lining is a procedure developed by Peter Booth at the Tate Gallery for reducing the vibration of a canvas painting. It involves attaching to the reverse of the original stretcher a new piece of fabric, preferably a thin but exceptionally stiff fabric such as polyester sailcloth. The painting is not in any way disturbed. The procedure should not be confused with the process conservators call “lining,” which is a procedure where the original canvas is adhered to a new fabric in order to strengthen it.With the fabric in position, there is less risk of crossbar-related cracks developing through impact, as a continuous surface, rather than the crossbar’s edges, would be contacted. A further advantage has been demonstrated in vibration tests showing a marked reduction of canvas displacement in response to low-frequency vibration. Cut out curved segments of the fabric to allow space for the crossbar(s) and wedges (stretcher keys). Remove the staples to free the material that should be folded and inserted between the canvas and crossbar(s). Once the fabric is unfolded and correctly positioned, attach fabric along the edges to the back face of the stretcher. Museums often use a shipping collar to protect their paintings. The wooden collar adds rigidity to the structure and a backing board can be attached to the back of the collar. The collar should project beyond the face of the painting so a rigid cover of foam core can be attached to the surrounding collar without touching the face of the painting. The entire package of collar, backboard, and face cover can then be wrapped in plastic without fear of damage to the painting surface. the cost of exhibitions and the associated shipment of paintings increases. Soft packing is common for graphic works such as prints and drawings and the practice has spread from commercial galleries and artists to museums. Soft packing is the replacement of plywood sided cases, with one having cardboard or foam sides.No work of art should be soft packed unless the institution is willing to risk major damage. Also, while there is extensive experience in soft packing, there has been little scientific research into how the best protection can be offered at minimal cost. Allow adequate time for the paint film to completely cure. Place an interleaf of polyethylene plastic no less than 4 ml thick onto the surface of the canvas before rolling. It should be cleaned of release agents, dust and other contaminants. Do not use bubble wrap, plastic wrap or thin plastics for this purpose, because they will likely ferrotype the painting surface. Roll and unroll paintings at room temperature. Rolling while cold may result in cracking, especially in thick paint films. Roll relatively loosely to reduce the risk of ferrotyping or adhesion. Once packed, tape securely, but not too tightly. Roll up the canvas as evenly as possible. Use a cardboard core six inches or greater. Tighter rolling increases the compression of the film. Put the rolled canvas into a larger tube. Use additional packing material to assure that the inner tube fits snugly in the larger tube. Whenever possible, the tube should be kept upright to reduce weight on any one side. This is most important for large canvases. Do not store paintings rolled up for extended periods of time. Unroll the painting as soon as reasonably possible. Sonotubes® are a product used by many artists who roll their artwork for transportation. Sonotubes® can be found at www.sonoco.com. If the painting is going to be opened by someone other than the sender, an envelope with explicit instructions for unpacking and repacking should be securely taped to the outside of the container. The taped envelope should read, “To avoid damage, read first before unpacking,” or something similar. 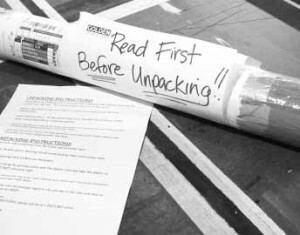 These instructions become invaluable if there is a dispute about any damage occurring during shipping, unpacking or repacking after an exhibit. Be sure to urge that all packing materials be kept with the crate(s). Do not assume that the person who unpacks will be the same person to repack the artwork. If the painting is being shipped to another country, it’s imperative that documentation in languages of those countries be used, so that an unwary inspector does not carelessly open a container without proper precautions. Check with all applicable agencies as to the preferred documentation. sufficiently valuable. There is also literature that can give guidance in this area. Some helpful resources are listed in this article. If you have any further questions regarding this issue, feel free to contact the GOLDEN Technical Support Department at 1-800-959-6543 or go to www.goldenpaints.com.